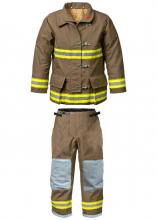 Globe invented turnout gear over 130 years ago and still offers the most advanced firefighter turnout gear on the market. Known to be the best-fitting and longest-lasting, Globe products are made with quality engineering skills that consider what customers want and what customers need to keep them safe. Globe’s products are manufactured in accordance with industry standards such as NFPA. 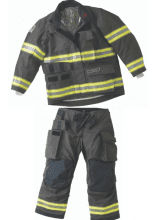 Most importantly, Ten-8 can offer package deals to protect firefighters from head-to-toe since Globe is an MSA company. CLASSIX® is Globe’s most affordable turnout gear, but that doesn’t mean it skimps on protection. The jacket features a drop-shoulder design that moves the seam beyond the shoulder for improved reach and reduced coat ride up, as well as a Yocco Drag Rescue Device and Trimax Thread Protection. CLASSIX® pants include liner openings to allow for easier access between layers, and padded H-back ripcord suspenders attached to horizontal loops so there is no hardware to dig in or pull out. With these standard features, the CLASSIX® is no ordinary gear. This gear offers all of the protection in a lightweight, flexible package. The G-XCEL® jacket features a standard longer back and shorter front, providing more coverage where you need it and less where you don’t. The jacket also includes AXTION® Sleeves to allow for extra length when reaching, a shorter contoured collar for easier interface with helmets, and offers a variety of additional options so you can decide what works best for you. The G-XCEL® pants feature AXTION® Knee & Seat configurations, allowing you to move freely, and give you the option to have SILIZONE® foam knees to make crawling more comfortable while protecting from water. With all of the features that made America’s most popular original gear, including Globe’s exclusive AXTION® Back, Sleeve, Seat, and Knee, G-XTREME® 3.0 provides improved comfort and flexibility, as well as personalization. Like the original, G-XTREME® 3.0 comes in shapes to fit every body. The jacket’s contoured sleeves are designed to work with you, not against you, while the one-piece contoured collar eliminates bulk and keeps its shape when flipped up or folded down. Durability is also a key focal point, as the jacket and pants feature double-stitched seams. 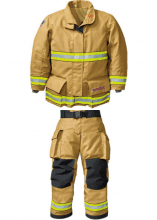 New material technology gives this turnout gear an athletic design with less bulk and more flexibility. ATHLETIX™ turnout gear is made of Kombat Stretch PBI/KEVLAR fabric, which allows for a closer and less bulky fit, NOMEX Nano thermal barrier material, 3M Scotchlite Comfort Trim reflective material, and GORE CrossTech Black moisture barrier to reduce heat stress.